I feel a bit foolish about this church. It was built in 1857, as a chapel of ease to St Helen. Pevsner dignified it with the adjective 'modest', and really you would hardly notice it as you rushed along the busy Cauldwell Hall Road. By the end of the 19th century, it was already much too small; an enthusiasm of freehold societies had taken off on the old heathland round about, and there were perhaps 20,000 people living in the parish. In 1898, the church was replaced, and the parishioners proudly moved to the massive red brick temple of Sir Arthur Blomfield's last great work. The new church stands just to the north. 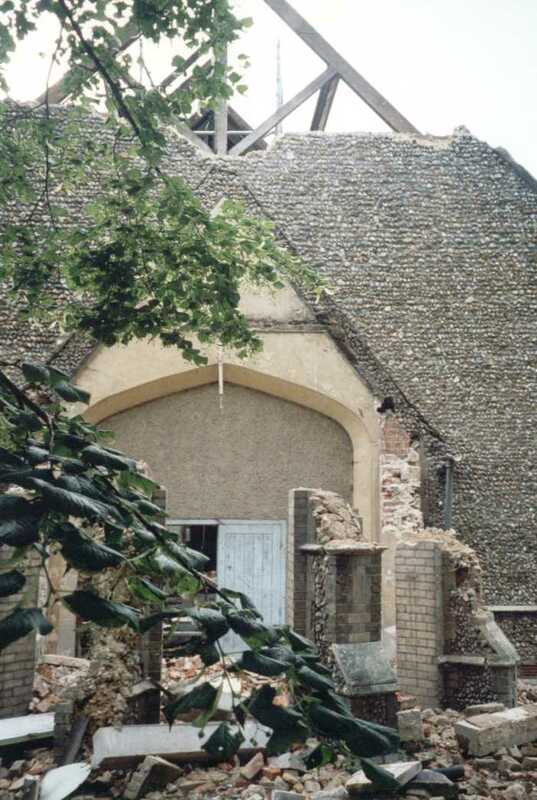 The old church became a school, and later a parish hall. Towards the end of the eighties, when I first knew it, it was in use as a day nursery. The reason I feel a bit foolish is that I lived around the corner for six years, and never once thought to photograph it. 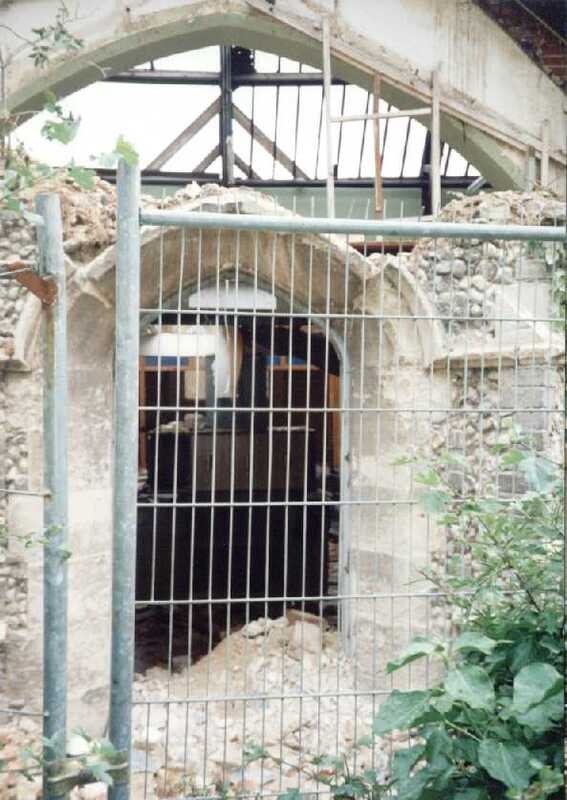 It was not until the summer of 2001 that, cycling along Cauldwell Hall Road, I noticed with horror that it was being demolished. I leapt off my bike, and took these photographs. A dismal record, perhaps, of an unassuming little church. 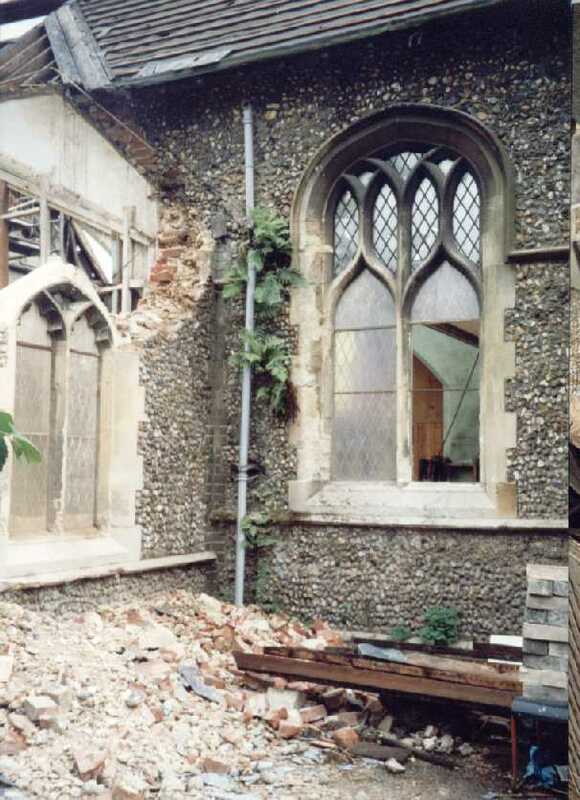 But for nearly half a century it was the spiritual home to thousands of east Ipswich people. 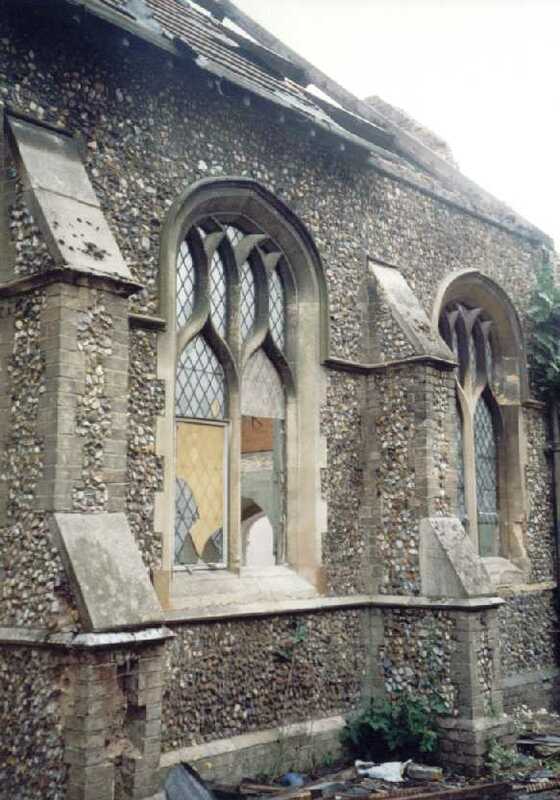 They were married here, they had their babies baptised here, and the rites of the Church of England saw them on their way to the brand new Ipswich Cemetery after they died. One of the parishioners here was the great Henry Ringham, one of the finest woodcarving artists of the century. He built Gothic House at the bottom of the road now named after him, and died in the parish in the 1870s. Also dating from the 1870s, and about half a mile east of the church, was the St John's children's home. If you wander along pleasant Freehold Road, and stop at the corner of Bloomfield Street, you are facing the site. 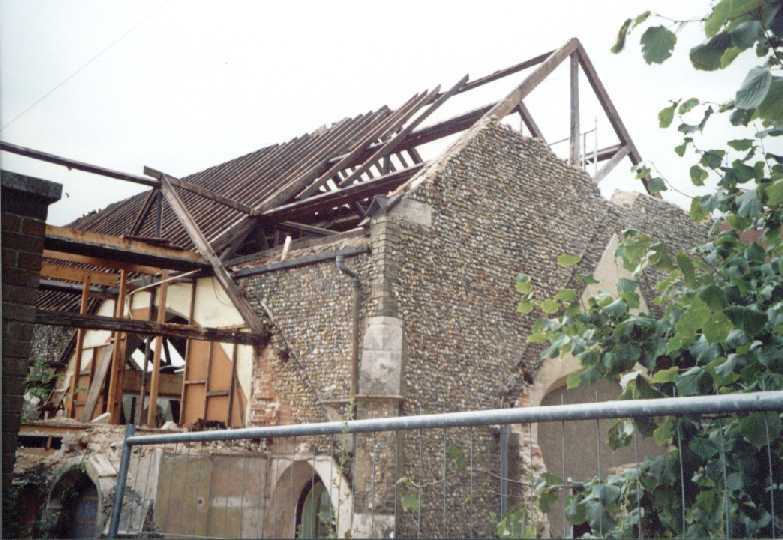 It was actually the Ipswich Poor Law Union workhouse for pauper children, meaning that they didn't have to be accomodated in the aging Whip Street workhouse, which itself would be replaced by a new one in this parish in the 1890s. Pauper children's workhouses were not unusual in more urban areas, but this was the only one of its kind in Suffolk, and as such seems to have been the place where poor orphans from all over the county ended up. Built in 1879, it had room for 130 children, and eventually closed in 1930. The site is now covered by sheltered housing. The site of old St John is now an all-weather play area, used as a carpark by the church on a Sunday. You would not know by looking that anything of significance had ever been here. 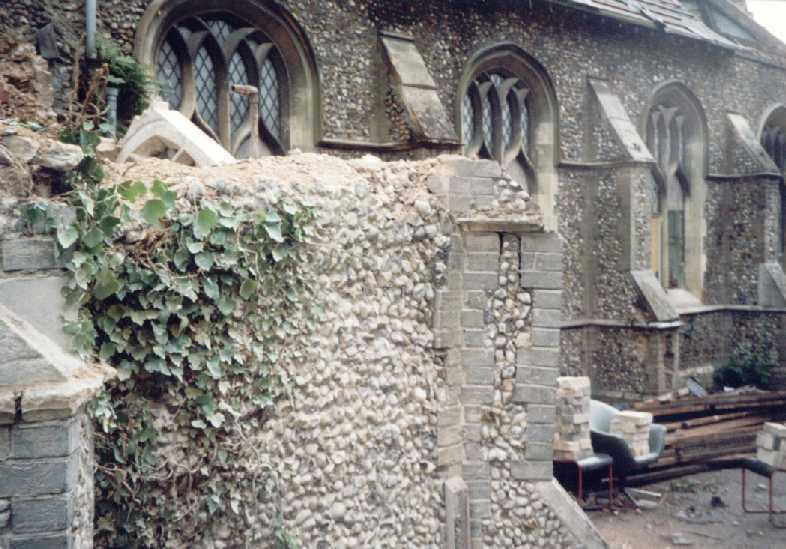 But it was during the lifetime of this building that the Church of England entrenched itself in sacramental glory - we may assume that this is yet another reason for Blomfield's creation next door - and became the national institution that would sustain itself until well into the 1970s and 1980s. 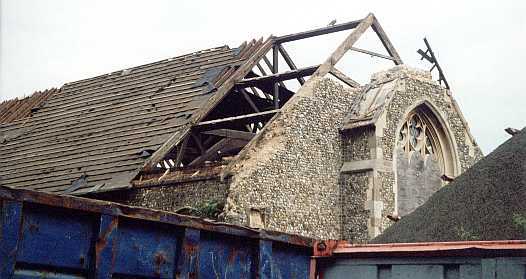 Perhaps the demolition of St John the Baptist can be seen as a symbol, a metaphor, for the demise of the Church of England. In which case, let these photos stand as a record. Mind you, I still feel foolish. The site of old St John can be seen at the Woodbridge Road end of Cauldwell Hall Road. It is the all-weather playing area to the south of the replacement church.